Most people we meet on our walks ask us, what kind of breed is this. 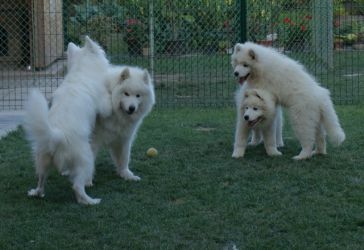 When they hear that word Samoyed, they are quite surprised, they give us a blank look and are somewhat puzzled...Samoyed is a nasty word...While they´re thinking about it, by that time our dogs greet them, lick them and jump around them. It can be said that they win their hearts with their beautiful smiles, cheerful pixie eyes and unconcealed joy from the presence of people. The joy is double if there are kids. 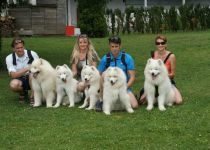 Members of our samoyed kennel live in western Slovakia in a town called Senica. 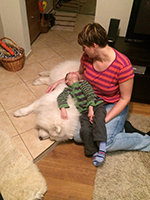 Samoyed enchanted not only us, but also our parents, but we can say that our entire family and friends too. Our families have always been linked with a dog. We had been having a beautiful, sparkish but also very mischievous companion called Niky for fifteen years. 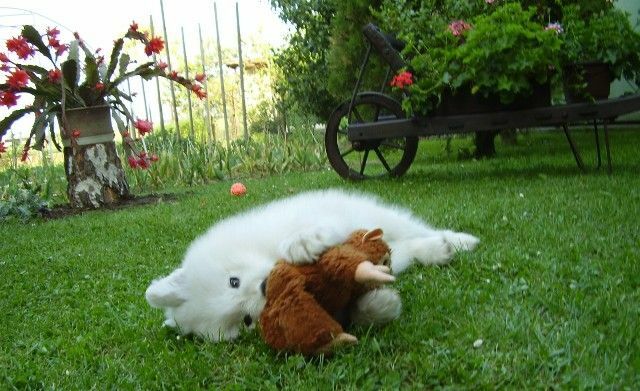 He was a white German spitz. That´s why we later looked for a dog that would be similar to him, especially with his looks. 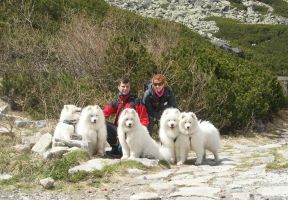 I heard about Samoyed, but in Slovakia it was almost impossible to see one. I managed to get hold of the book ´´Yoshi and us´´, and later we attended an exhibition where we finally met Samoyed on live. His owners depicted his character to us and after that we decided immediately. 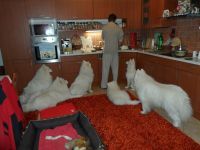 Yes we want Samoyed. 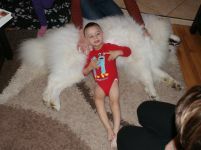 A few visits to samoyed kennel followed and it was only a matter of time when a new member joined our family. 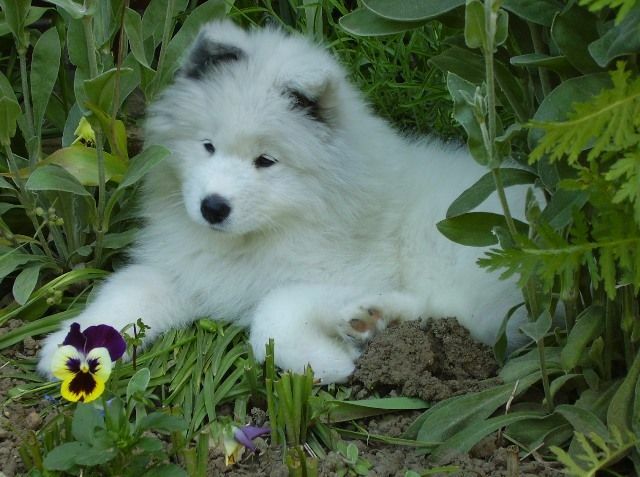 In 2006, our first Samoyed lady called Zara - D´Blanche Xamba Yoshi and us arrived. A little cheerful carefree snow ball...from the first day we enjoyed loads of fun with her. Zara is a typical breed representative with all pros and cons. As a puppy she was very prankish and we thought we probably ´´made a mistake´´ when we were choosing a breed. But nothing could ever be denied. She looked at us with her adorable puppy eyes and everything was solved in that moment. She couldn´t be resisted. 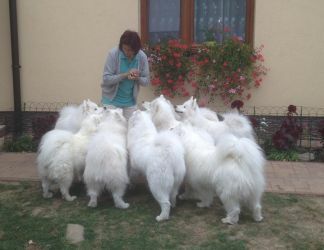 Gradually she became a true Samoyed queen. 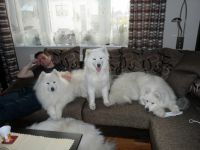 We started to think about having puppies and so we asked for protected name of the Samoyed kennel. 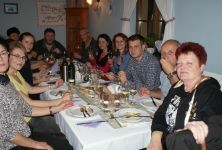 That´s how our kennel Carpathian White Smile was created. We welcomed our first litter „A“ in summer of 2009. Zara gave birth to not less than 9 puppies right away. Father was a beautiful dog called Fík from Slovak breed. That was a good lesson for us. We decided to keep one baby girl from this litter, but which one? There were 7 of them! We decided for Lilly Ann. When we thought Zara was mischievous, it was nothing compared to what Lilly did. Lilly Ann is vivid, restless, foolish and very curious. She is constantly on the move, waggling her tail, displaying her joy out of everything. We saw our third litter "C" through in 2012, when for the first time but sadly also the last time Lilly became a mother. 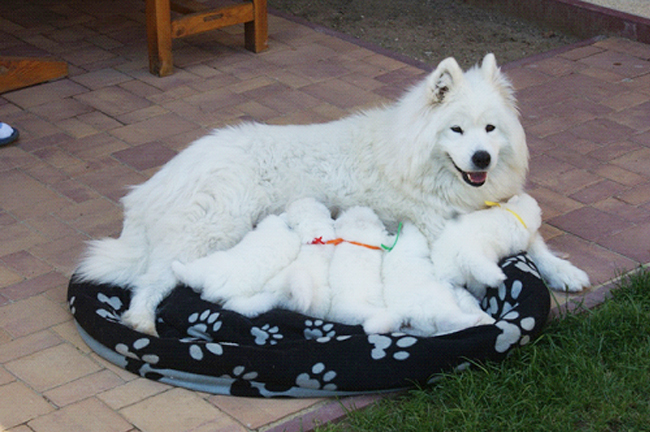 She gave birth to 3 little puppies, one female Zaira and 2 dogs. We spent next months, that seemed too long, looking for a perfect ´´bride´´ for our Bastion. The dream became a reality at the end of 2014, when we brought a little tomboy Reeva from Estonia . Zaira became a mother of our litter "D" in spring of 2015. Father was a wonderful dog Willy from Croatia. Reeva was glorious and sharp-witted little puppy, she disciplined us like no other dog before her. We made all efforts, but things went quite bad as medical examinations for dysplasia of her hip joints confirmed our worries. 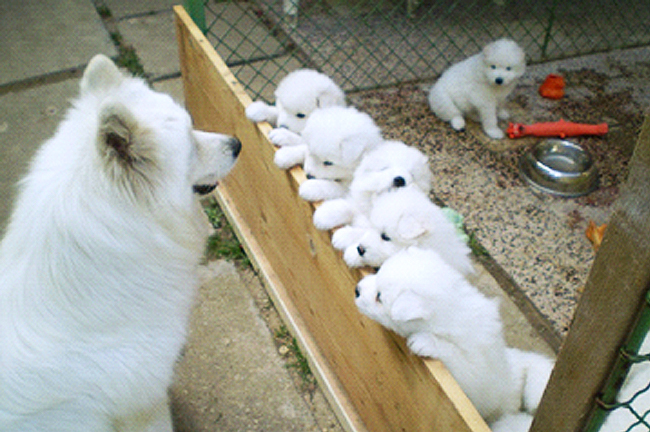 Our little Samoyed world was falling apart and we were thinking whether or not to stop breeding. Thanks to our family and friends who had supported us we decided to go on. In 2016 we imported adult female Alice from Finland. She loves to cuddle so much she wins everyone´s heart. Alice became a mother of our next litter "E" in the fall of 2016. Father couldn´t be anyone else but Bastion….. In 2017 we decided to go for our next big dream. Yes, it was related to our next litter and it was a huge challenge for us. I had been mulling over this idea for several years…At first there were no money or time...then there wasn´t appropriate female dog...but after all we decided that this year is the time to make a little road trip to England for a promising "husband" for our Alice – dog Nikara Diamond Dancer, known around the world as "Dan the Man". It was a hot summer and during one of our barbecues we came upon an agreement with the family of our little Zara junior (Dessert Rose Carpathian white smile), that we would breed her now and not in the spring of 2018, as originally planned. 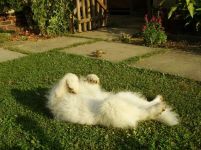 And so in the course of ten days, there were two Samoyed "dates", at first Zara with Laki in Prague and then Alice with Dan in Bournemouth. And for the rest of the summer we had been eagerly waiting for what the ultrasound shows...Hurray! 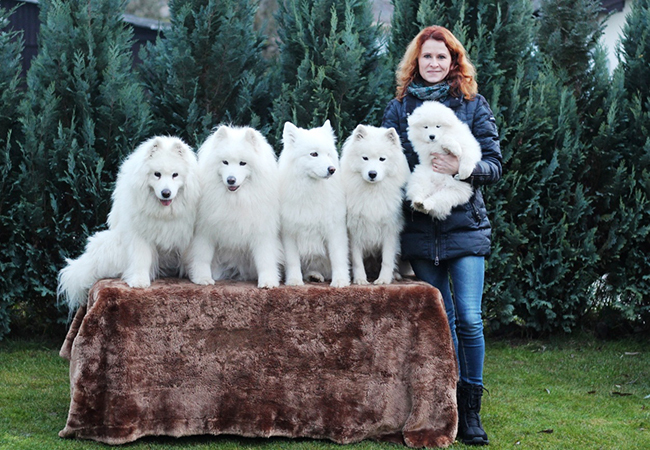 Both Samoyed ladies will become moms! We always enjoy the "puppy period" very much…because when they are born I feel like they´re staying only for a while and in a few weeks they go to their new families. 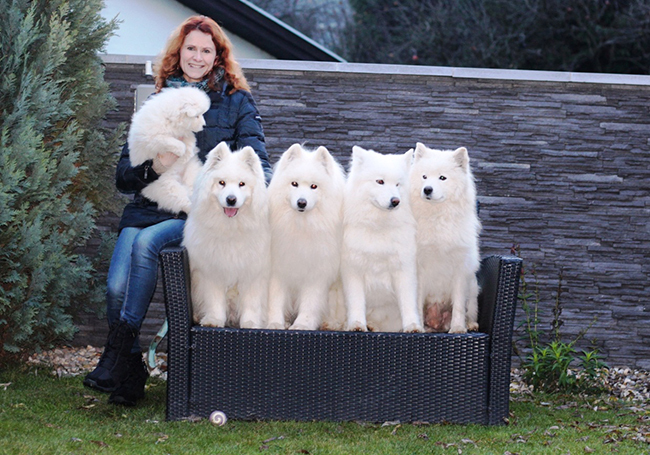 And so another big dream came true...having 5 generations standing next to each other...5 beautiful Samoyed ladies...and I´m very proud of it! They have joined us for our various trips, visits and hikes. We often visit our friends, who are dog owners too and fool around together. 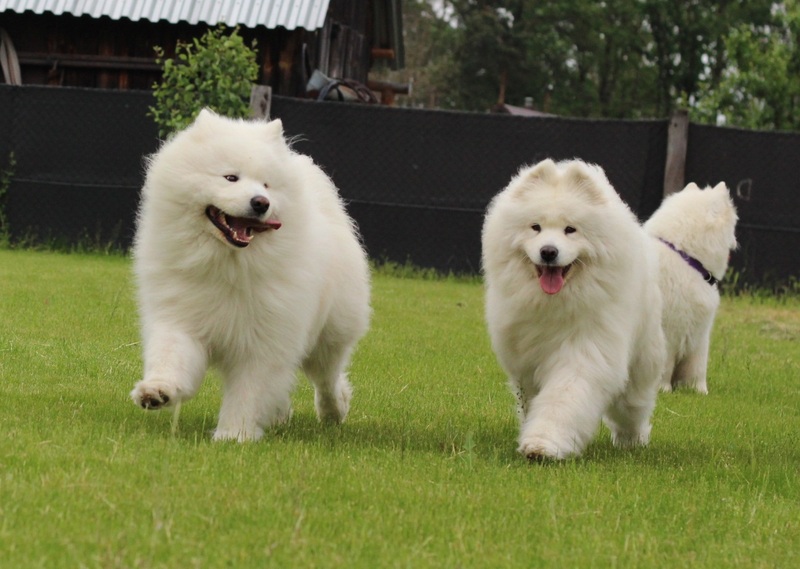 Samoyed has majestic appearance. 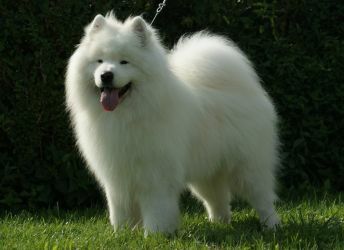 Bathed, combed out and always well-tuned Samoyed possibly catches everyone´s eye. We fell for exhibitons almost instantly from the beginning of our lives with Samoyed dogs. 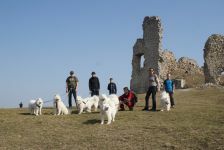 However, we have mostly attended them because of contact with people and other dogs from different parts of Slovakia or Europe. The results are not always that relevant since it´s up to subjective opinion of particular judge, and no title or failure can affect our love for our dogs. But we can take pleasure in nice exhibition awards. 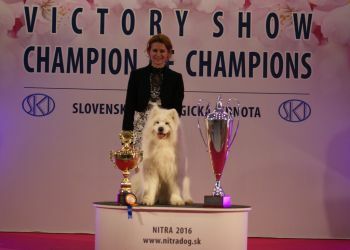 Our dogs are champions of several countries, international champions, club winners and BIS. You can see the results at profile of every our dog. Our puppies also bring us joy and we have achieved some beautiful results. For example our Azara Alizee who lives with her family in Bulgaria, has been awarded the Junior Champion of Montenegro and Bulgaria, Balkan Junior Champion, Champion and Grand Champion of Bulgaria and Balkan Champion within a few months. Our female Zarka ( Desert Rose) won many prizes out of 4 club and special exhibitions. She achieved 3x Junior Speciality Winner , Junior Club Winner, 2x BIS Junior, 2x ResBIS Junior and BOS. 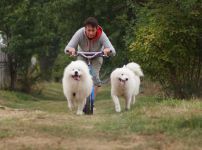 It´s worth considering that Samoyed is an active dog. He can get used to "home regime" but he still needs some movement activity, ideally with people. 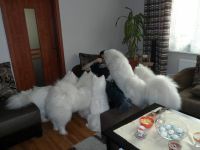 Even if you have two or more samoyeds and a big yard, they will always appreciate your company the most. 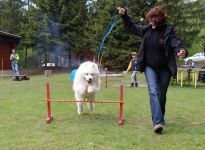 We have visited various dog events or camps with our dogs. Actually at our very first camp in Czech Republic, we absolutely fell for this breed of dog. We like to engage in various competitions, whether it´s agility or "sausage" run. We tried weightpulling too and our Lilly Ann pulled 600 kg. 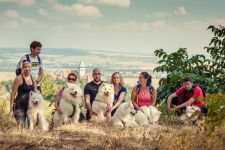 Although when we´re at home we don´t engage in sport acitivities with our dogs that often, but we prefer to take them for longer walks or different hikes. Zara has successfully passed personality test, which means she is a suitable dog for canistherapy. Though, we haven´t practiced it yet due to a lack of time. 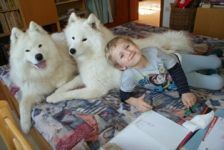 From time to time little Filip, who loves Samoyeds very much, comes to visit our Bastion, Lilly and Alice, because petting them improves his fine movements. 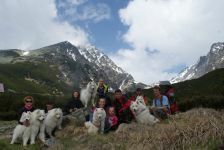 Samoyed Tour – We have tried everything with our pack, but we have found pleasure in various excursions besides exhibitions. The dog needs to go out, outside his own territory, and even though we have a house with a yard where the pack can move freely all day, we go for long walks every day. During weekends or leisure time and holidays, these walks are extended to short treks. 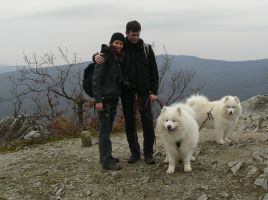 Even when we only had one Samoyed - Zarka, we went to see different ruins of former castles, forests, mountains and so on. 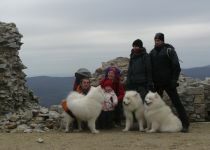 With the increasing number of dogs, other equally crazy Samoyed dog people joined our group. 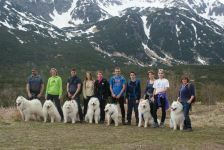 As other people have noticed our big group, they have started to be interested in getting to know more about these beautiful dogs. 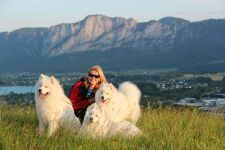 After a few years of such domestic meetings and trips, we decided to give our activities a "brand name" and so we called them Samoyed tour ...because we wander with our Samoyeds all around the place. 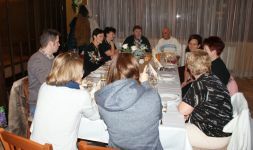 And after the tour we have some fun while cooking goulash or barbecuing. 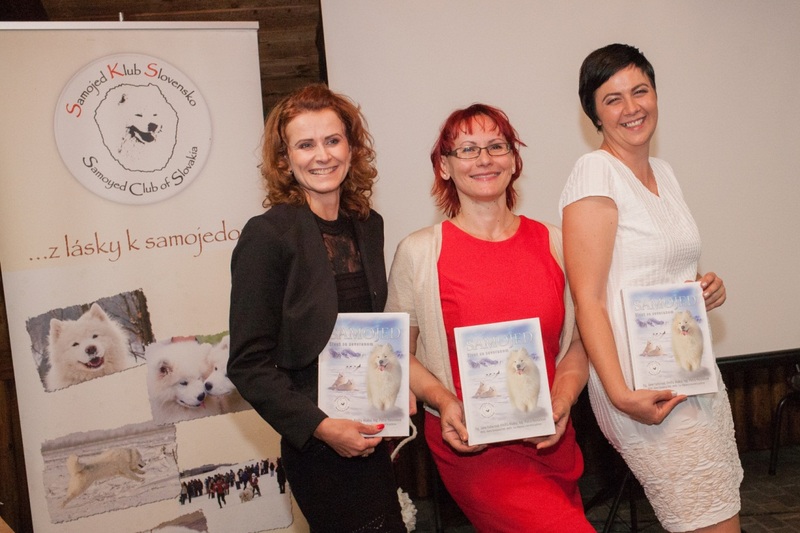 Our utmost plan is to enrich our breeding of Samoyeds in Slovakia with new blood in the future. We have strived for healthy individuals, our puppies are socialized and they have a stable character. Fathers of our puppies have been chosen very carefully, we have always picked out dogs of superior quality from abroad. Nonetheless, a very challenging task is to find a good home for our puppies. This must be the place where a dog will be the part of the family. We don´t want new owners to go only to the exhibitions or races (although success is always pleasing) but we want our dogs to feel the love of their new owners. 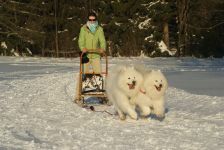 Samoyeds are our source of energy. 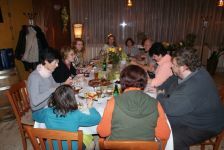 They have constantly showed us their pleasure of life and of our company. 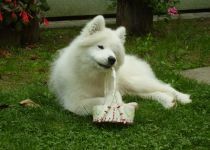 Samoyed is a member of our family. We can´t even imagine our life without Samoyed.. 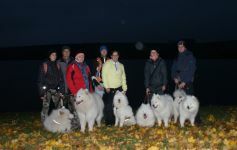 In the end I´d like to mention Dr. Frank Comhaire´s quote, which he said at the World Samoyed meeting:“ The future is bright, the future is white“.